2015 Toyota Camry SE TOYOTA CERTIFIED! CARFAX VERIFIED 1 OWNER! *DESIRABLE FEATURES:* a BACKUP CAMERA, FACTORY CERTIFIED, BLUETOOTH, an MP3 COMPATIBLE RADIO, and KEYLESS ENTRY. *SERVICE & MAINTENANCE COMPLETED:* Stock# FU069196A FEATURES NO LESS THAN $420 IN PREVENTATIVE MAINTENANCE & SAFETY EQUIPMENT UPGRADES. Specifically the reconditioning process on this Toyota Certified, 2015 Toyota Camry Included: Our Toyota Direct ASE Certified Technicians completed a Toyota Certification Inspection. Toyota Direct s T.C.I. Includes, A 127-point inspection along with the following: An oil change, wiper replacement, cabin filter along with an engine air filter., and Our Columbus based Auto Detailing Team performed a complete interior & exterior vehicle detailing! 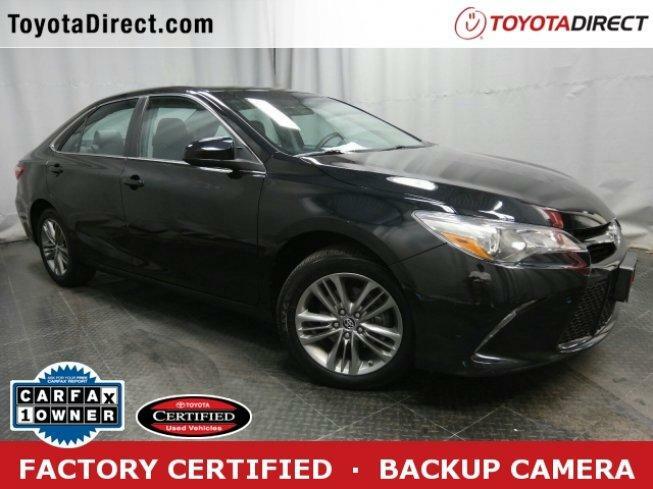 This front wheel drive Toyota Certified 2015 Toyota Camry SE features an impressive 2.5 l Engine with a Attitude Black Exterior with a Black Cloth Interior. With only 23,806 miles this 2015 Toyota Camry is your best buy in Columbus, OH. *TOYOTA CERTIFIED:* With this 2015 Toyota Toyota Certified Camry SE, you have far more than just a used vehicle. You have confidence, pride and a vehicle that you can trust. Your Toyota Certified Toyota can be counted on to go the distance with higher resale value.This CPO vehicle has passed a stringent certification process in order to qualify as a Toyota Certified. Your 2015 Toyota Camry was subjected to a comprehensive 160-Point Quality Assurance Inspection using Authentic Toyota Parts. For even more peace of mind consider: Your 2015 Toyota Camry SE includes a factory-backed 7-Year/100,000-Mile Powertrain Limited Warranty, 12-month/12,000-mile Comprehensive Warranty, 1 year of Roadside Assistance, Reconditioned to Toyota's exacting standards by Toyota factory-trained technicians, CARFAX Vehicle History Report .